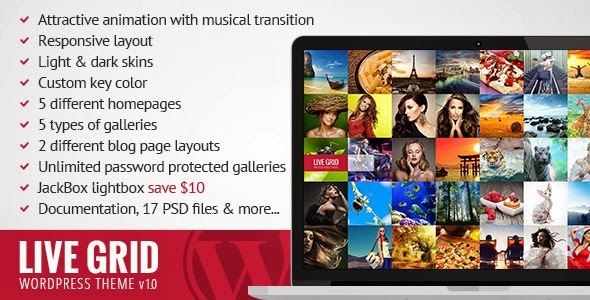 Live Grid – Responsive Interactive WordPress Theme was specially created according the latest web technologies. It includes a unique menu, animated image grid, full screen photo portfolios, photo and video masonry and grid portfolios, client proofing page, image adaptivity for each screen size, ajax page preloader, share social icons for photo and video items and much more. It can be great for photographers, media agencies, hotels, restaurants, design bureaus, interior studios and for other representatives of creative areas. Oswald Bold, Open Sans and PT Sans Narrow google web fonts. Images for preview were purchased on depositphotos.com. The clipart is not included in the source archive. Item Reviewed: LIVE GRID - Responsive Interactive Photography WordPress Theme 9 out of 10 based on 10 ratings. 9 user reviews.